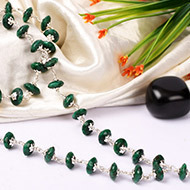 The Emerald Gemstones is considered to be one of the most precious of all the gemstones. 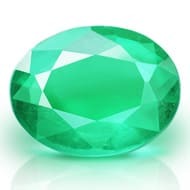 It's a derivative of the mineral beryl (a silicate of aluminum and beryllium) and the metal chromium that leads to the typical bluish-green color that is so famous as the hue 'emerald green' which is now a color shade on its own merit. Most of the gemologists know that an Emerald gemstone which is perfect is very rarely found. An Emerald Gemstone is usually graded visually – its color should be a typical hue of dark green that has yellow and blue as secondary colors, and it should be pleasant (and not warm) to the touch. It's common for emeralds to be cracked, so a good eye and a sensitive touch can detect if it is flawless or not. 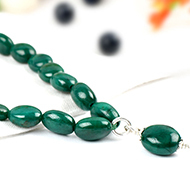 Emerald Gemstone may be treated with oil to enhance their transparency and excellence. 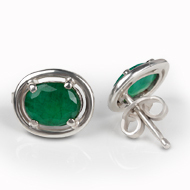 Emeralds Gemstones have been revered throughout human history. The Mughal Emperors were believed to be very fond of them. US Museum of Natural History has some excellent specimens of Emerald Gemstone. The majority of the finest Emeralds are today mined and produced in Colombia and Zambia, although during ancient times they were produced in Egypt and India. Known for thousands of years in the Indian subcontinent as Panna, Emeralds have long been connected with love, compassion, learning and mental development. 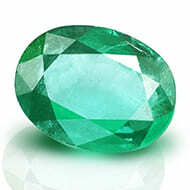 Zambian and Colombian Emeralds are the most prized specimens around the world. 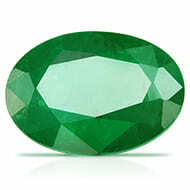 Brazil, Afghanistan and Pakistan is also known for their Emeralds. 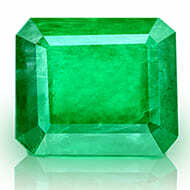 As such Emeralds are routinely found and discovered all over the world. 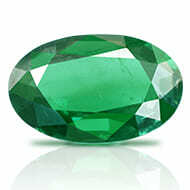 In Vedic astrology, the healing properties of the Emerald Gems are associated with the planet Mercury. In Vedic Astrology, Mercury is believed to be the messenger of the Gods. Hence it represents intelligence, wit and humor in a person. Mercury is considered a benefic planet but in certain situations, it can turn into a malefic too. 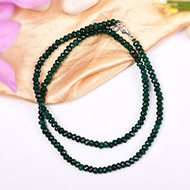 The Emerald Stone is usually worn as jewelry – beads, pendants, earrings, rings and bracelets of emerald are very popular. As the ruling planet of the Emerald gemstone is Mercury, this gem can counter the ill effects of Mercury and well as enhance the good effects of the same. In ancient and pre-modern times, it was thought to produce healing powers just by gazing into the intense green color. The ancient Greek practitioners have advised using the powder of crushed Emerald gem as an eye-healing powder. Wearing a combination of Gemstone and Rudraksha is the best way to make the most of it. 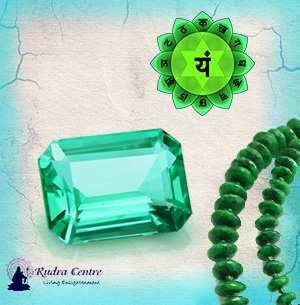 Rudraksha Ratna Science Therapy® (RRST®) devised by Neeta Singhal makes the use of both Emerald gemstone and Rudraksha beads. It is a holistic healing therapy that uses the curative and healing properties of Rudraksha and Gemstones to balance and energize Chakras. In RRST we deal only with natural and un-treated gemstones. The reason Rudraksha Ratna Science Therapy is widely acclaimed by many is that it works on Chakras, the very basis of life and is a holistic therapy that heals from deep within with absolutely no side effects. In RRST setting of a gemstone, as a ring or as a pendent, the bhasm made of the planetary herb is kept inside one tube and the metal that improves the planetary effects, is kept in another tube. 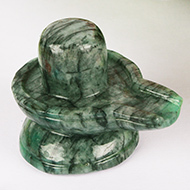 In case of Emerald, Apaamaarg Bhasm and metal Bronze are used to attract the cosmic power of Mercury. 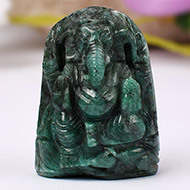 The gemstone is then energized with its precise seed mantra on a specific day to empower it to eliminate all the malefic effects of the planet and reinforce its beneficial effects. Thus the gemstone becomes a powerful talisman suitable to be worn by any person irrespective of his birth chart. During consultation, the blocked Chakras that are causing the mental, emotional and physical issues are identified and limiting beliefs are addressed. Chakras become imbalanced when your thoughts and attitudes tend towards fears and negativity when facing challenging situations in life. Blocked Chakras manifest emotional disorders and physical ailments. You can live a successful, loved and happy life only after your blocked Chakras are activated and balanced. As per the Chakra status and concerns of the client, a suitable combination of Gemstone and Rudraksha bead is recommended. As per the cosmic color they emit, the gemstones work on specific Chakras. 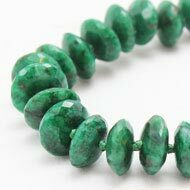 So Emerald works on Anahata (Heart) Chakra and the RRST Consultant identifies the correct finger position for drawing maximum energy from the stone. Rudraksha and Gems are powerful agents of energy and work on releasing the negative energy stored in the form of stress in the blocked Chakras, thereby activating them and tuning them to their natural state. Anahata, the heart Chakra, is the seat of compassion, trust and signifies following of Dharma. It gives us the ability to gain insight in the mentality and character of other beings. It is a purification station that clears the wine from the drab. Only purity can ascend to the higher centers of the head. All this happens when energy moves upwards through the body. It is the seat of the senses and governs the sense of touch and action of feeling. Thus the heart connects our physical existence with a power which comes from the universe. The purpose of Anahata Chakra is to become open to love and compassion, both to yourself and others around you. Color green of this Chakra denotes growth and renewal. When Anahata Chakra is blocked, you fear commitments and feel as if you have to please others to be Loved. You mistrust and hurt by others in relationships. You overly guard yourself from being hurt again. When Anahata Chakra is open, you are comfortable in your relationships, you are able to give and receive love easily. You feel a heartfelt sense of gratitude for how wonderful your life is. You appreciate others and feel compassion for both yourselves and others, without feeling sorry for anyone. At Rudra Centre all the gemstones are pre-energised as per vedic rituals and can be worn immediately, on the suggested specific right/left hand finger. It can be worn on a Wednesday or any auspicious day or any day, in the morning after bath. If need be, one may additionally chant the seed mantra “YAM” 108 times before wearing. Jyotish is the Sanskrit name for Vedic astrology, meaning "science of light".